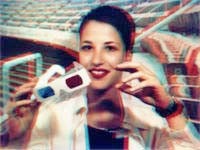 A 3-D photo pooth developed by Steve Hines to produce a 3-dimensional color photo on large-format Polaroid film, and vend a souvenir photo frame with 3-D glasses. 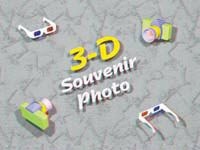 The booths are provided with 3-D camera, interior light, lighted sign, sample viewer, bill receptor, and a 3-D background which enhances the depth. 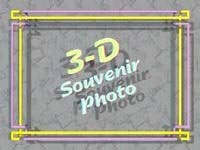 The 3-D photo booths are ideal for theme parks, vacation areas, the beach, shopping malls, ball parks, etc. 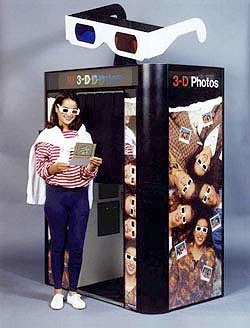 This is not a product for sale by HinesLab to end users, but rather 3-D technology being offered for license to photo-booth manufacturers. EuroSlot magazine, June, 2002, p. 39. Stereo World magazine, Nov/Dec. 1995, p. 28-29. This is a technology announcement and license offer, not a product being offered for sale to end users. Photographic equipment manufacturers are invited to contact Steve Hines to discuss a manufacturing and sales license.